Percy sits alone in his room. He has just laid his wife to rest and through the pain of his grief, he tries to make sense of why she died. His fevered imaginings conjure a sinister and horrific story, but how much of it is fact and how much of it is the workings of a tortured, grief-stricken mind? I may be a little late to the party with regards to the TRAGIC TALES OF HORRERE anthology series, and for that I apologise because the couple of collections I’ve read recently have some really, really good stories within them. 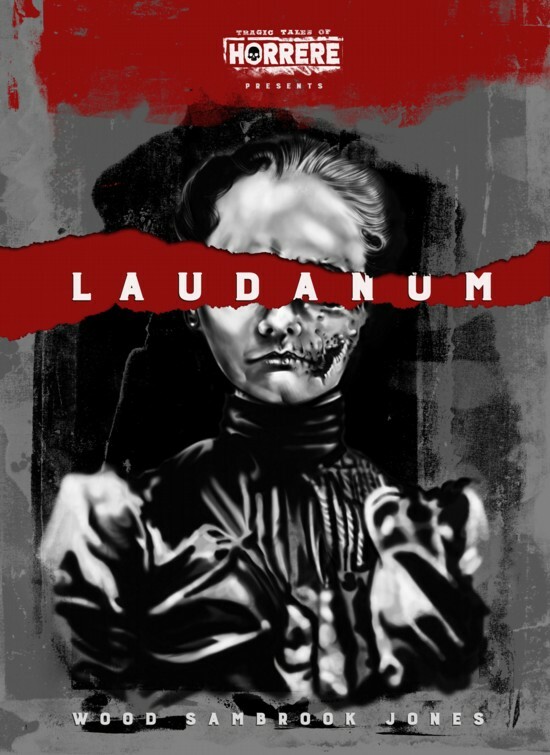 Laudanum is a stand-alone short comic from the series that I found whilst searching through COMICHAUS, taking the form of a short, claustrophobic, single location Victorian Gothic horror story that, without being overly dramatic, is breathtakingly disturbing. Because it’s such a short book, I’m going to struggle to say anything about the plot without entering the realms of massive spoilers, but what Robin Jones and Michael Sambrook have produced in a story that’s only 16 pages long is a fantastic example of how to write horror (horrere?). What I thought worked particularly well was the ambiguity as to whether the supernatural elements of the story were real or part of Percy’s mind protecting him from the horrors of his wife’s death. Alisdair Wood’s artwork is gorgeous. The heavy pencil sketch style is perfect and conveys a lot of depth and darkness that really builds the tension of the story, and the style works superbly in depicting a Victorian setting. The more horrific parts of the story are extremely well illustrated but, as with the narrative, leave enough to the imagination to keep you guessing. This is a great book. The writing by Jones and Sambrook is excellent, the artwork by Wood is superb and whilst I felt the story was fantastic in the 16 pages it was delivered in, I would love to see a bigger, more expanded story from these guys.